Discitis, also spelled as diskitis, is a condition where the spaces between the spinal bones (vertebrae) becomes irritated and inflamed. There are spongy discs known as the intervertebral (IV) discs in the space between the vertebrae which assist with spinal flexibility and firmness and acts as a shock absorber. The tissue between the vertebrae is prone to infection, as is the vertebrae. When the bones are inflamed or infected, it is known as osteomyelitis. Discitis specifically refers to the tissue between the vertebrae, namely the intervertebral discs, although the infection also involves the space in the spinal canal and tissue surrounding the spine like the paraspinal muscles. Discitis is mainly due to an infection. However, in most cases these infections do not start within the discs or even the surrounding vertebrae. Instead it arises at distant sites and travels through the blood stream (hematogenous spread) to reach the spinal column. It is then known endogenous infection. In many of these cases the vertebrae are first infected and then the infection spreads to the disc space. The blood supply to the spinal column is via the spinal arteries and to a lesser extent from the radicular arteries. 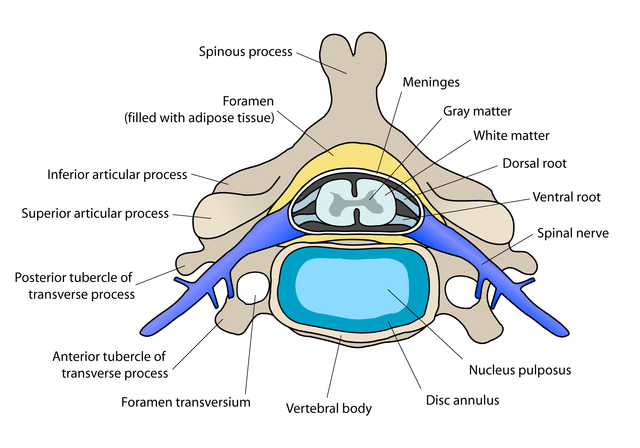 The intervertebral disc itself lacks a direct blood supply and oxygen and nutrients have to diffuse from the end plates of the vertebrae on either side of it. When the infection spreads from a distant site, it has to pass through the vertebral end plates to eventually involve the discs. Therefore the vertebrae are usually infected as well. The infection first causes death of the spinal end plate and then spreads to the intervertebral disc. It extends to the inner walls of the spinal canal into the epidural space. The soft tissue around the spine can then also become infected. The risk at this point is that the infection can affect the tissue of the central nervous system – the spine and even extend up to the brain. This has serious consequences and about 1 in 10 patients with discitis may have permanent neurological complications. Discitis can affect any intervertebral disc space. The spinal column is made up of 24 vertebrae that can articulate and 9 fused vertebrae that lack an disk space. Therefore there are 23 intervertebral discs present in the human spine – 6 in the cervical region, 12 in the thoracic and 5 in the lumbar region. The lumbar region is the most commonly affected in discitis followed by the cervical region. The thoracic region is the least affected. Since the sacrum is a fusion of several vertebrae and the coccyx has only cartilage between the bones that are not fused, discitis cannot occur at these locations. Discitis presents with non-specific symptoms at the outset. Since the condition is mainly seen among children younger than 10 year of age, the reporting of the symptoms may sometimes be confused or exaggerated. Among younger children who cannot report symptoms, changes in behavior particularly mobility needs to be noted to to assess the condition. Back pain is the main symptoms seen in discitis.It is severe and tenderness may be noted by pressing over the affected area. When the lumbar region is affected, there is pronounced low back pain. Discitis in the cervical region presents with severe neck pain. Although the pain is worse in the affected region, patients often report generalized back pain. Difficulty moving is another major symptom of discitis. It is largely due to the exacerbation of pain when walking and standing as these are the times when there is increased pressure on the discs. Children may refuse to stand or walk without expressing that it is painful to do so. There is also stiffness of the back, worse at the affected site, which hampers movement especially bending over (lumbar discitis) or looking down or up (cervical discitis). Stooping over in a bid to increase the curvature of the back may be seen, especially in children who attempt to compensate for the pain. Low-grade fever and other flu-like symptoms are also present with discitis. Children may be irritable and unable to specify the symptoms. The symptoms tend to worsen over time if discitis is left untreated as the condition does not resolve on its own. Other symptoms may also be seen as the infection causes neurological complications, which may be permanent. Through the blood stream (hematogenous spread). Infection of the vertebrae and disc space occurs most commonly when microbes, specifically bacteria, travel from another site in the body to the back. Usually the infection at these distant sites are well established before dissemination via the blood stream (hematogenous spread) eventually reaches the spine. It is therefore referred to as an endogenous infection. Other sites apart from the spine may be simultaneously affected. Pre-existing infections that can lead discitis includes urinary tract infections, pneumonia, bacterial endocarditis or soft tissue infections. A less common way that bacteria can travel through the blood to reach the back is in intravenous drug users. Contaminated allows bacteria to enter the blood stream and reaching the spine without establishing an infection elsewhere in the body. Another means by which an infection can affect the discs directly is by bacteria entering the spine during surgery or even an open back injury. This is uncommon and is known as exogenous infection. There is no pre-existing infection elsewhere in the body. Although rare, discitis has been reported to arise with acupuncture needles (Discitis in an adult following acupunture treatment). Any person can develop discitis but it is more likely in one or more of the following risk factors. Cancer patients, especially when on chemotherapy. Discitis is not always easily diagnosed by the symptoms alone. Various diagnostic investigations are therefore necessary to conclusively diagnose discitis. Blood tests are helpful in confirming an infection but does not conclusively identify the site of the infection. Sputum and urine tests may also be helpful for infections that have spread from the lungs or urinary tract respectively. Imaging studies are necessary for a diagnosis of discitis..
An x-ray, CT scan or MRI may be used. Magnetic resonance imaging (MRI) and computed tomography (CT) scans are prefereable as it can diagnose discitis early and with greater certainty. Although an x-ray can also diagnose discitis, it is only useful for diagnosis several weeks into the infection. Biopsies (either needle biopsy or open biosy) are other more definitive diagnostic techniques to confirm discitis. Discitis requires antibiotic treatment and prolonged bed rest until the infection resolves. An orthotic brace may be used for several months thereafter. Analgesics may be prescribed for pain control in discitis. Immobilization also helps with pain control, proper healing and preventing further spread of the infection. A patient should under bed rest for at least 2 weeks or once the pain resolves without the use of painkillers. Surgery is not often necessary for discitis if the infection is detected early, there are no complications like neurological conditions and the patient responds to antibiotics. Surgical procedures in discitis may be conducted for several reasons associated with the disease process. In some cases the affected vertebrae may be fused surgically although this often happens on its own following discitis treatment.